Genetic differences between two very similar fungi, one that led to Quorn, the proprietary meat substitute, and another that ranks among the world's most damaging crop pathogens, have exposed the significant features that dictate the pair's very different lifestyles. While the manufacturer of Quorn cultivates strains of Fusarium venenatum via fermentation into a mycoprotein dough for human consumption, farmers try to fight off Fusarium graminearum as this pervasive fungal pathogen invades multiple crops and threatens global food security. Researchers have now pinpointed several significant differences between the fungal pair that seem to turn F. graminearum nasty, features that promise targets for controlling disease. The findings, by a team from Rothamsted Research, are reported today in the journal, BMC Genomics. The team discovered, for instance, that F. venenatum does not contain some clusters of genes that produce subsidiary compounds, or secondary metabolites, which are produced by F. graminearum during successful wheat infection. "Using improved computer software, we have enhanced gene predictions and secondary metabolite gene cluster predictions in both species to a level not found in most other filamentous fungal species," says Robert King, the team's lead bioinformatician at Rothamsted. Emphasising the importance of the findings, King notes: "All this improved data is immediately available in the public domain via ENSEMBL [a genome database]. In the medium term, it should be possible to achieve a resilient control strategy for this globally important, cereal-infecting pathogen." The team also confirmed differences in mating strategies, notably that the pathogenic fungus can mate with itself, which influences gene transfer between generations and genome repair mechanisms, whereas the Quorn fungus would need to find a mate. And they found that key areas in chromosomes, the centromeric regions, are 25% smaller in the benign fungus, for reasons unknown but that offer "an excellent starting point for follow-up investigations", notes Kim Hammond-Kosack, a molecular plant pathologist at Rothamsted and leader of the research team. "This is an important and fascinating piece of work that shows the many differences between F. venenatum and the plant pathogen F. graminearum at a number of different levels," says Rob Johnson, Science Manager and Fermentation Specialist at Quorn Foods. "Despite the close relationship revealed by the sequencing," continues Johnson, "the differences in lifestyle are written deep into the genomes of these fungi, with the saprophytic F. venenatum showing a range of genes devoted to breakdown of organic matter, whereas the F. graminearum contains unique genes for secondary metabolites and more devoted to its pathogenic nature." 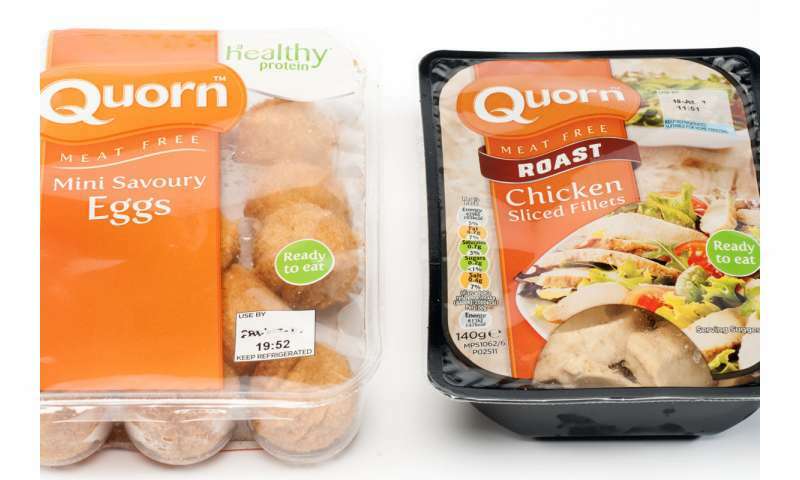 Johnson adds: "The confirmation of the non-pathogenic nature of the species used to make Quorn and understanding of the genetics revealed by these data will make this paper one that Quorn will return to many times as we improve our process and grow our business." In separate research, also funded at Rothamsted by the Biotechnology and Biological Sciences Research Council, the team has been unravelling the pan-genome of F. graminearum, a reference genome that includes the genetic make-up of the pathogen and also those of its various strains. "We can now immediately identify which of the newly predicted secondary metabolite gene clusters and small secreted protein effector sequences are found in all pathogenic strains of F. graminearum," says Hammond-Kosack. "These sequences then become the targets for a far narrower set of follow-up gene function studies in F. graminearum by reverse genetic experimentation to pinpoint the genes essential for the disease-causing abilities of this pathogen." Hammond-Kosack concludes: "Starting from the fundamental new knowledge gained from these studies, a sustainable discover and disease control pipeline has begun to be created."